Shop For Earrings with Gemstones | Rocks & Co. In the world of 'Low-end' stores online and off, "cheap" earrings are easily found in the UK without much of an effort. There is, however, a growing schism between disposable "cheap jewellery" made of lower end plastics, glass and base metals, etc., and, affordable, earrings of value where only genuine gemstones and precious metals are used. Cheap is actually not so cheap for the planet and our souls. Lower-end costume jewellery surely is fun and has its place especially amongst the kiddie and tweenie set, but its mass consumption impacts the environment and our economy. Genuine gemstone earrings set in sterling silver and gold are jewels to be collected, treasured and maybe even passed down. Jewellery is meant to be collected and cherished and the minerals, materials and work put into the production should be honoured. In a time of disposable everything, let us take a breath and value what should be valued. It is a difference that we a very proud of at Rocks and Co., where we exclusively create genuine gemstone earrings set only using sterling silver, white, pink and yellow gold. Because of our long history in the gemstone jewellery business, our expert gemstone hunters and relationships with the mines we are able to offer lovely genuine gemstone earrings and jewellery at very affordable prices! Hoop earrings come in a wide array of sizes and styles from sweet petit little 3cm thumb size hoops to 8cm very large statement hoop earrings. Hoops can be sterling or gold and with or without embedded jewels. Jewelled hoops are like adding cherries on the earring Sunday. You don't have to add them but they are so luxurious with them! "The big four" in the gemstone world are the four precious gems considered the most valuable and sought after. These are Diamond, Ruby, Emerald and Sapphire. We are grateful to have some exquisite specimens here at Rocks and Co. and are using them in our earring, ring, necklace, pendant, and bracelet designs! Single or multi-stone stud earrings are seriously dressed up with Diamond, Ruby, Emerald and Sapphire which are classic and beautiful, set in sterling silver or gold and at Rocks and Co. Gorgeous and still quite affordable. "Shine bright like a Diamond"- Sia. Oh, how lovely to have a pair of Diamond stud, hoop or drop earrings in your jewellery collection. Simply divine. Diamond earrings are certainly a “forever” gift to another or one's self. The gem is known for being the strongest and for having the highest shine. Emerald earrings will entrance all who look upon them. Actually, it is a fact that gazing at an emerald calms stressed eyes and it was a practice of lapidaries to have a group of Emeralds to gaze upon to rest their overworked weary eyes. There is a reason why Emeralds are part of the Big 4 most desired and valuable gemstones in the world. The value of a Ruby is dependent in part on its deep red colour. Set on their own or paired with the flattering white of a Sapphire, Diamond or Zircon, as smaller secondary stones. The combination is crisp and glamorous. Rubies are always movie star stunning. Set in White gold or platinum gives the blood red Ruby the extra visual pop. They are unbelievable. Cushion cut, oval and emerald cut all suit the glorious Ruby. Sapphire is the birthstone of lucky September born babies. Sapphire rates 9 on the Mohs scale of hardness, which is extremely hard, second only to the Diamond. 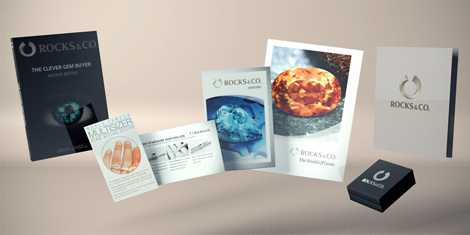 At Rocks and Co. we love to employ many from the stunning Sapphire family in our Sapphire earring designs including the royal blue Burmese Sapphire, the precious blue Ethiopian Sapphire, mined in Tigrai state, the gorgeous deep dark blue Kanchanaburi Sapphire, the Laos Sapphire, the salmon to cognac coloured Padparadscha Sapphire, the Pink Ceylon Sapphire, the Purple Ceylon Sapphire and the Unheated Padparadscha Sapphire! All set in beautifully created stud, drop and hoop earring settings of sterling silver and gold.